We have learned that even though 하니까 and 해서 are both used to reason out, they are not completely interchangeable. 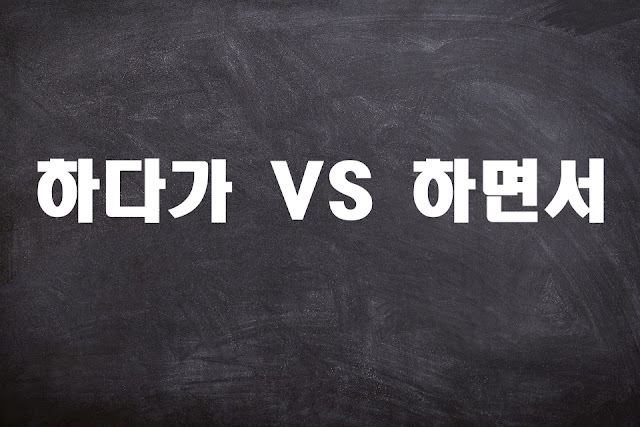 In this note, we are going to tackle another puzzling case between 하다가 and 하면서. In basic Korean grammar, we are taught that [verb + (으)면서] is used to express two actions being done at the same time. Here are some examples. My mom called my dad while she was cooking. I listen to music while I work out. 컴퓨터 게임 하면서 욕을 많이 해요. I swear a lot while playing computer games. In above sentences, each of the two actions happens in parallel with each other. They happen simultaneously. Likewise, there are two actions involved in 하다가, but they are not necessarily simultaneous. For example, you are texting in the street when you bumped into someone. You are not yet done texting but you stopped because you bumped into someone. The 하다가 is the verb that is still ongoing when another action happens. Let’s take a look at some examples. 영화를 보다가 문득 가족 생각이 나요. I suddenly remember my family while watching the movie. 교실을 청소하다가 그 편지를 봤어요. I saw the letter while I was cleaning the classroom. 집으로 걷다가 비가 많이 왔어요. I was walking home when it rained cats and dogs.